An intuitive and thoughtfully designed new offering from Ford, the 2018 Ford EcoSport will drive you wild with technology, storage options and a powerful engine! Ford's exclusive Bang & Olufsen audio system will delight even the most ardent audiophile, while high-tech safety features protect your most precious cargo. Available in four trim levels, the 2018 Ford EcoSport truly offers something for everyone! Continue reading to learn more about the incredibly versatile 2018 Ford EcoSport. Ford's award-winning 1.0 liter three-cylinder EcoBoost engine makes a cameo in the 2018 Ford EcoSport. This turbocharged engine provides an efficient burst of power that will deliver every time you merge or accelerate! If you feel the need for more speed, the 2.0-liter four-cylinder engine offers Ford's Intelligent 4WD as a standard feature. Intelligent 4WD allows the 2018 Ford EcoSport to seamlessly switch between front-wheel and four-wheel drive, offering more fuel efficiency and a smoother ride. Both engine options are paired with a six-speed automatic transmission. The 2018 Ford EcoSport SES offers a sport-tuned suspension and tighter steering. Either engine provides powerful acceleration and a smooth ride that are sure to make you fall in love with the 2018 Ford EcoSport! The 2018 Ford EcoSport was designed for the driver's comfort, and is filled with all the technological features you want and need! 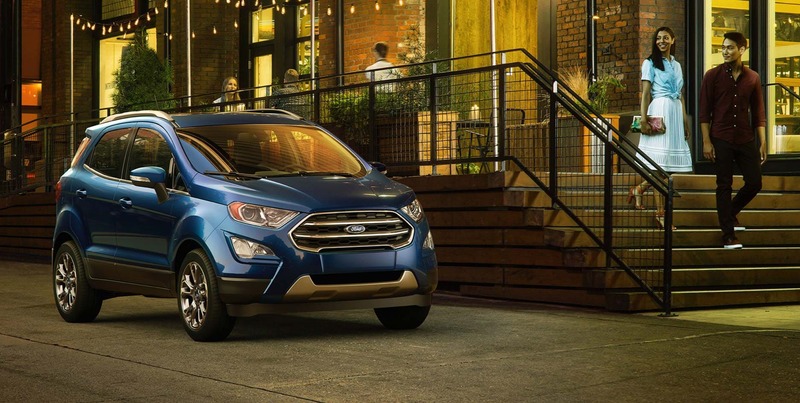 Available in ten exterior paint colors, seven ambient lighting options and four trim levels; the EcoSport S, the EcoSport SE, the EcoSport SES and the EcoSport Titanium; it is easier than ever to customize your vehicle! All trim levels feature a unique swing-gate-style tailgate, perfect for loading cargo into the expansive trunk area. The 2018 Ford EcoSport is loaded with technological features that will delight both the driver and passengers. The Sync3 system from Ford is an intuitive audio sound system that uses voice recognition to respond to driver commands. 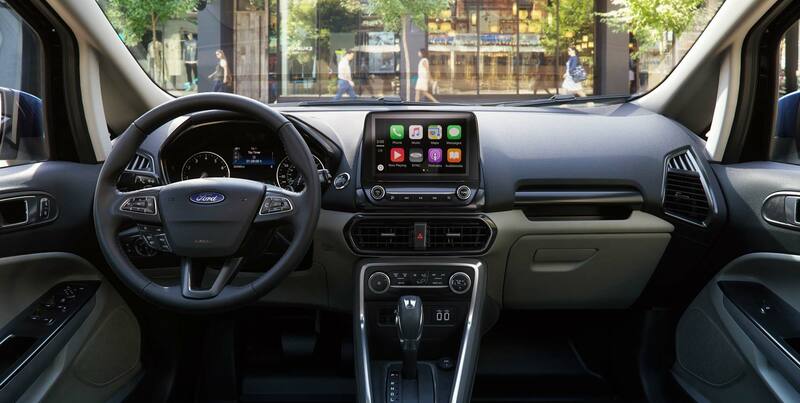 Hands-free communication, the B&O speaker system and an 8-inch tablet-style touchscreen display are all synced up with Apple CarPlay and Android Auto. The mobile-compatible FordPass lets owners view vehicle information, fuel levels and odometer readings. Two USV fast-charging ports keep your gadgets charged, while two 12-volt power outlets provide power for passengers and a 110-volt outlet lets you plug in common household items. Over two-dozen storage pockets, bins and hooks create efficient storage throughout the cabin, while fold-away second row seating offers even more cargo space! 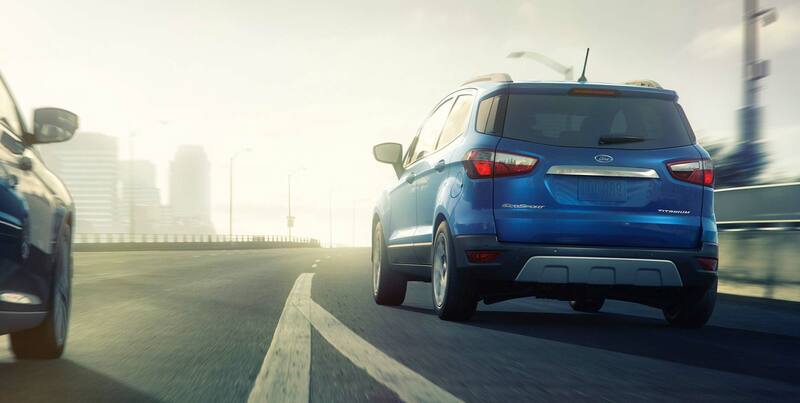 No matter how you choose to outfit your 2018 Ford EcoSport, you'll be glad you picked this sporty little vehicle! How many engine options are available for the 2018 Ford EcoSport? There are two engines available for the 2018 Ford EcoSport; a 1.0-liter three-cylinder EcoBoost engine and a 2.0-liter four-cylinder engine, both paired with a six-speed automatic transmission. Where can I view your entire Ford inventory? We make it easy to view our entire inventory of Ford vehicles! Click HERE to view our entire inventory! Can I get my Ford serviced at your location? Yes you can get your new 2018 Ford EcoSport serviced by our knowledgeable and friendly staff! Click HERE to schedule a service appointment! The 2018 Ford EcoSport offers plenty of security and safety features on top of all its technological and functional touches! Ford knows that your family is the most important thing in your life, so the 2018 Ford EcoSport works hard to protect them! Available with Blind Spot Information Systems that alert you to cross-traffic patterns and vehicles approaching your blind spots. Auto Start-Stop Technology helps to reduce fuel consumption and emissions. The 2018 Ford EcoSport offers a powerful engine, customizable features and plenty of storage. Come visit our Wilmington, DE location and test drive a 2018 Ford EcoSport today!